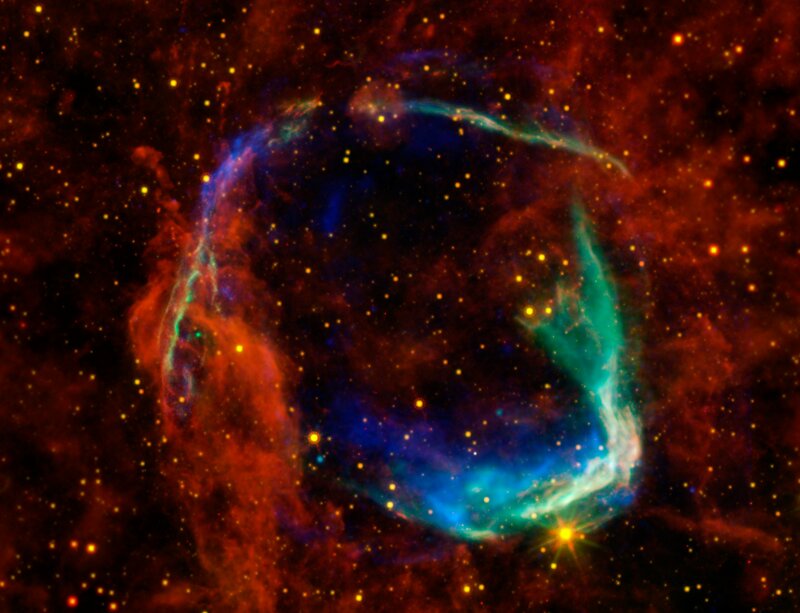 ﻿ Why are supernovae partly responsible for the formation of elements? Why are supernovae partly responsible for the formation of elements? as what their importance is for us. Elements are widely composed of electrons, protons and neutrons, but increasing the number of subatomic particles in the nuclei of an element requires a vast amount of fusion energy in adding each extra particle to the nuclei. In other words, the lighter elements are more abundant than the heavier ones in the universe. Hence, hydrogen is the most abundant element due to its simple structure(one proton and one electron). But, somehow, the elements heavier than the hydrogen such as carbon and oxygen have been formed in the universe despite the complexity of their structure. The formation of the elements heavier than hydrogen was detected while astronomers had been observing the sky to try to understand that how stars shine continuously. Hans Bethe, a distinguished nuclear physicist, made an important contribution to the theory of stellar nucleosynthesis by explaining how stars shine continuously with a series of nuclear reactions. In other words, he explained the proton-proton chain reaction which yields the heavier elements. In the core of stars, the vast accumulation of mass causes to the fusion of hydrogen that is the notion of being forced to form helium. And, most of the brightness comes from the energy produced during the hydrogen fusion. However, the fusion of hydrogen cannot preserve the core of a star shining continuously from being collapsed. In a star of modest mass, when the hydrogen fuel in its core has been exhausted(1), the nuclear reactions perpetuate the merging of elements to produce energy by the fusion of helium into carbon and oxygen. On the other hand, in truly massive stars, the production of element continues up to iron because of the high pressure and temperature of its core. Fusion processes must stop once the stellar core has become iron because the production of elements heavier than iron actually consumes energy rather than releases it(2). Then, how have the elements heavier than iron, such as gold and uranium, been formed? A supernova is a huge explosion happening when energy yielded by the merging of elements in the core cannot resist the gravitational force produced by the massive star. In other words, the fusion energy cannot prevent the outer layers of the massive star from collapsing. So, the massive star implodes and radiate most of its mass into space to avert the detrimental effect of gravitational force on its core. The inevitable explosion of the massive star that is so intense and hot stimulates many nuclear reactions producing a series of heavy chemical elements, including plutonium, uranium and gold. The process is widely called supernova nucleosynthesis. Thus, supernovae are the primary source of heavy elements in the universe and partly responsible for the formation of elements. Also, novae may cause the formation of elements if its mass is high enough to stimulate a nuclear reaction. The reason is as follows. A nova is an explosion happening in a binary star system. One of the stars in the binary system, a carbon-oxygen white dwarf, steals matter from its companion star(3). It is called accretion. Eventually, the white dwarf accumulates too much matter and spread all material possessed by itself out. If the white dwarf accretes too much material, a gigantic explosion occurs(supernova) rather than a nova. What Tycho Brahe's first impressions of supernovae were when he observed one: “On the evening of 11 November 1572 Tycho was walking back from his observatory for supper when he was brought up short by a brilliant white light outshining Venus. ‘Amazed, and as if astonished and stupefied, I stood still, gazing with my eyes fixed intently,’ he wrote. ’…I was led into such perplexity by the unbelievability of the thing that I began to doubt the evidence of my own eyes.’ What Tycho had witnessed was a huge stellar explosion, a phenomenon that would one day be known as a supernova(4)." (1) Bely, Pierre-Yves, Christian, Carol, and Roy, Jean-René. "What is a nova? A supernova?." A Question and Answer Guide to Astronomy. Cambridge: Cambridge University Press, 2010. 20. Print. (2) Bely, Pierre-Yves, Christian, Carol, and Roy, Jean-René. "What is a nova? A supernova?." A Question and Answer Guide to Astronomy. Cambridge: Cambridge University Press, 2010. 21. Print. (4) Cohen, Richard. "THE EARTH MOVES." Chasing the Sun: The Epic Story of the Star That Gives Us Life. London: Simon & Schuster, 2010. 146. Print.